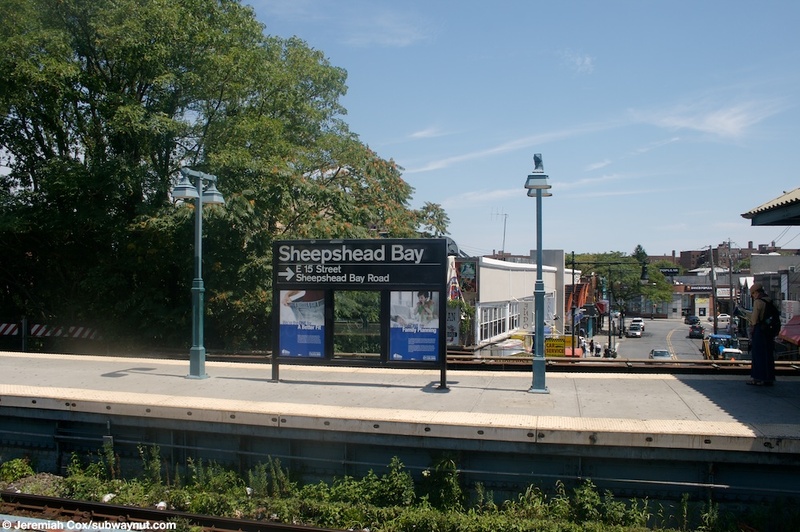 Sheepshead Bay is an Brighton Line Express Station. The station is located on an embankment and has two fairly narrow island platforms for the four-tracked line. The station has two exits. 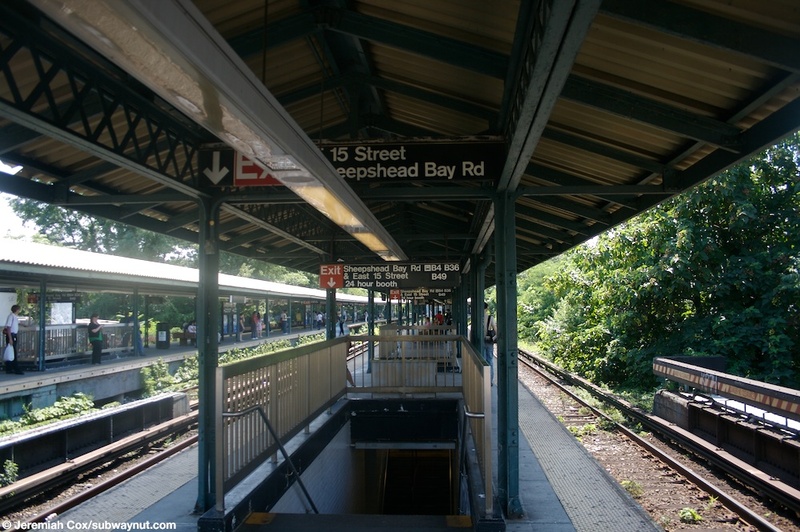 One is at the extreme southern end of both platforms, a single staircase at the end of each platform leads down to ground level where there isn't station house with doors, the fare control area is simply tucked beneath the extremely wide elevated structure. This area consists of a part time token booth and turnstiles, with High Entrance Turnstiles provided access at other times. It is extremely set back from the northern sidewalk of Voorheis Avenue (east of East 14 Street), which is also the Northern service road of the Belt Parkway/Shore Parkway (Highway has two names). The next station exit is more towards the northern end of the station, it consists of two staircases down from each narrow platform to a main station house area that was nicely retiled during some recent renovations. 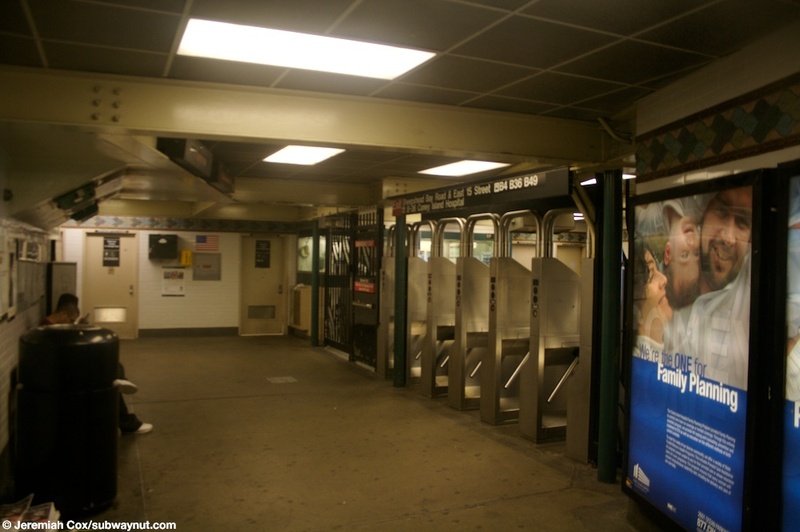 This has the full-time token booth facing its turnstiles, as well as restrooms (open the standard 5 am to Midnight), within fare control. 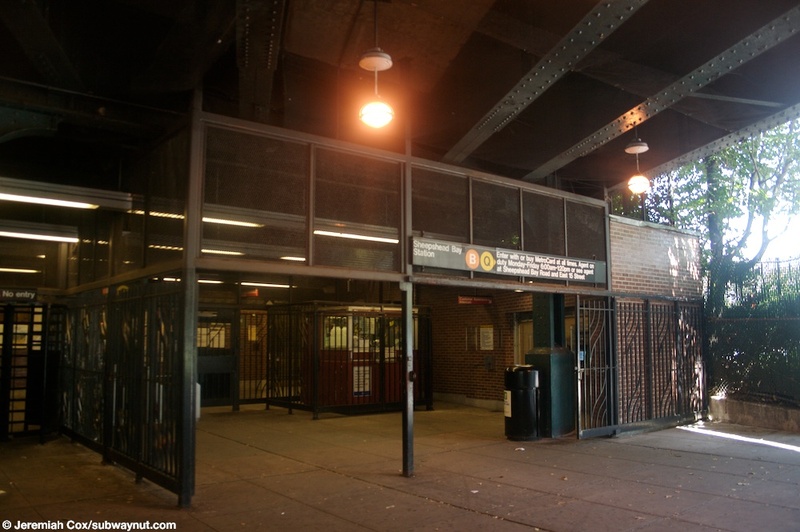 This station house is the typical Brighton Line one, located at ground level on Sheepshead Bay Road, on the southern sidewalk right at the southern end of East 15th Street. Both platforms are canopied for the length between their two exits, and are exposed at their northern ends. 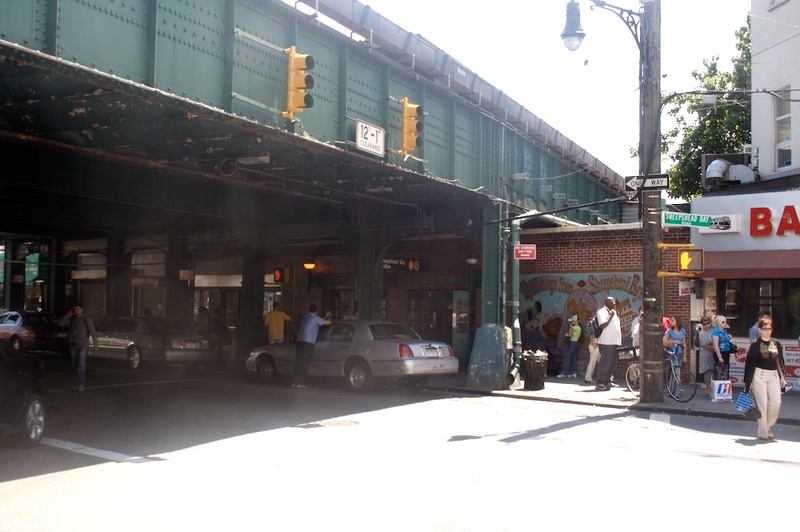 Recently, because of construction closing one direction of Neck Road and Avenue U from 2008 to 2011, a temporary, covered mostly wooden crossover bridge has been erected at this portion of the platforms to provide an additional crossover transfer for those commuters who have to double-back as part of their regular commutes. 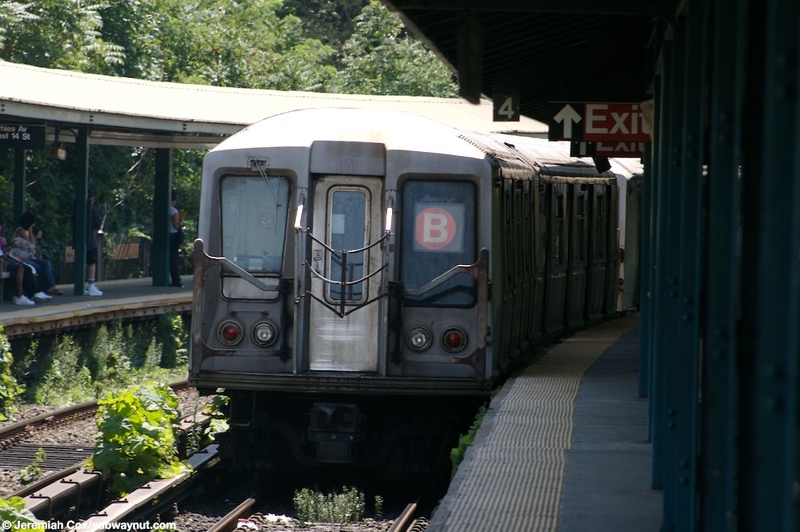 (sheepshead_bayb1) A R40-Slant B train begins to leave Sheepshead Bay to travel its one additional stop to Brighton Beach before terminating. 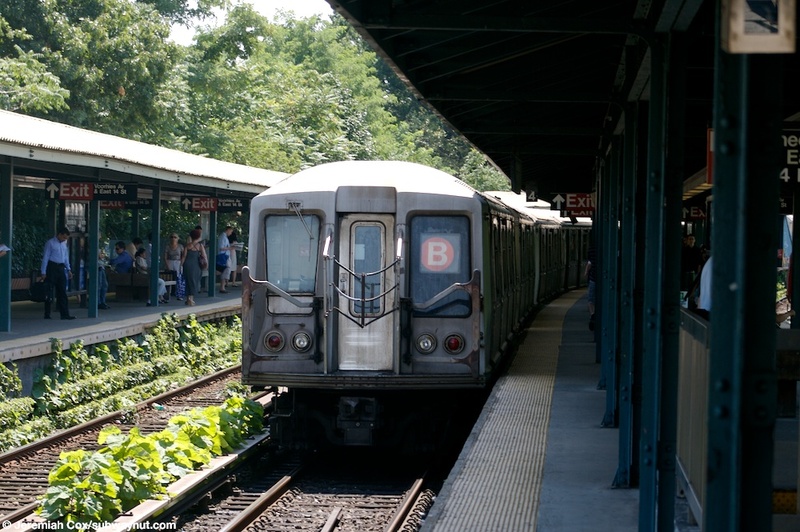 13 August, 2008 (sheepshead_bayb2) A R40-Slant B train continues to leave Sheepshead Bay. 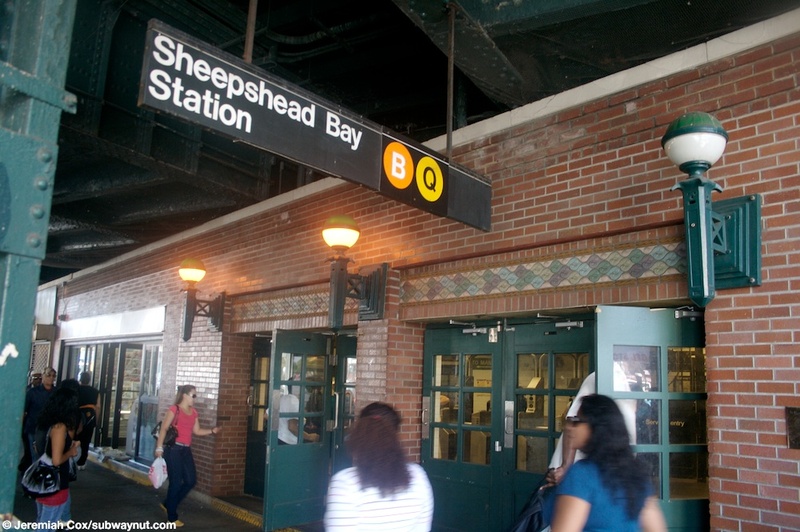 13 August, 2008 (sheepshead_bayb3) The exposed northern end of the Sheepshead Bay Station, small mini windscreens with arrows pointing towards the station's two exits, simple lampposts. 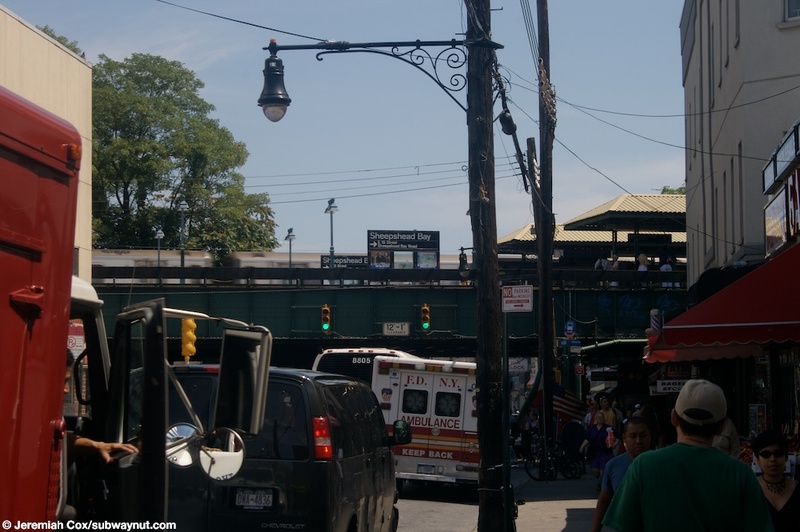 13 August, 2008 (sheepshead_bayb4) Looking across to the Manhattan-bound platform at Sheepshead Bay, at the exposed northern end of the Manhattan-bound platform, the shops of Sheepshead Bay Road are clearly visible from the el. 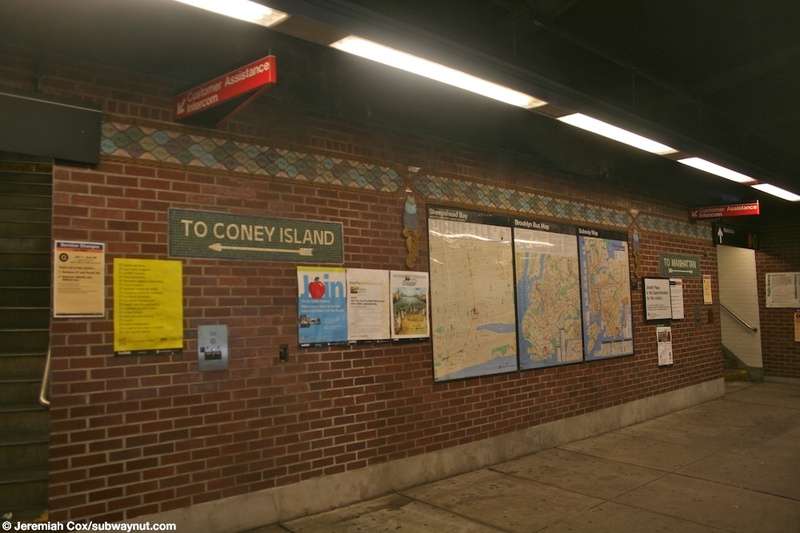 (sheepshead_bayb5) Looking down the Brighton/Coney Island-bound platform by the two staircases down from it to the main station house/fare control area to E 15 Street & Sheepshead Bay Road. 13 August, 2008 (sheepshead_bayb6) An interior view of the small, but well tiled waiting area within fare control for the main exit at Sheepshead Bay. 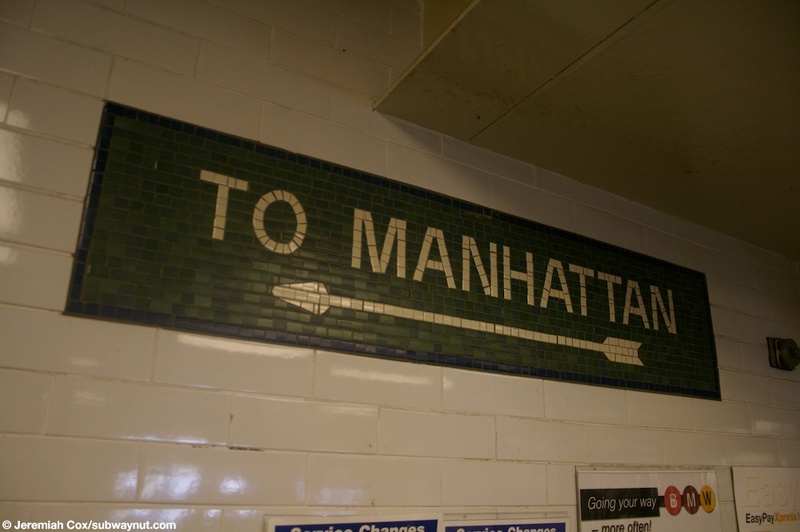 13 August, 2008 (sheepshead_bayb7) A mosaic To Manhattan direction service sign. 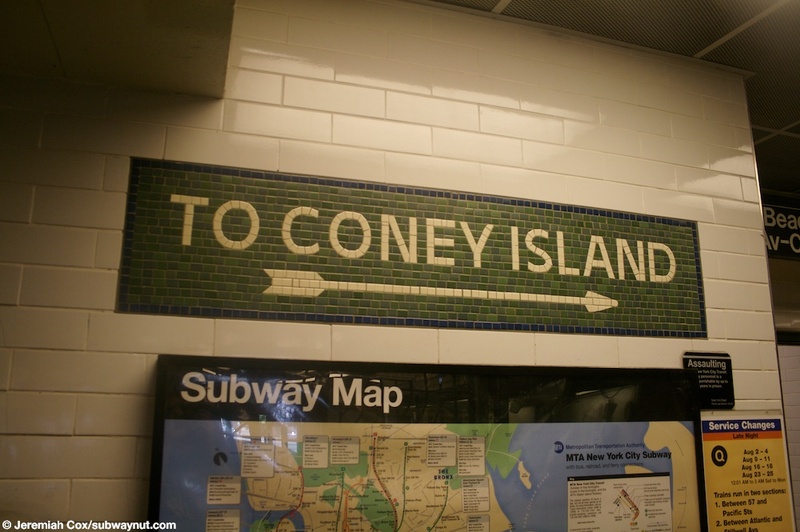 13 August, 2008 (sheepshead_bayb8) A mosaic To Coney Island platform direction sign. 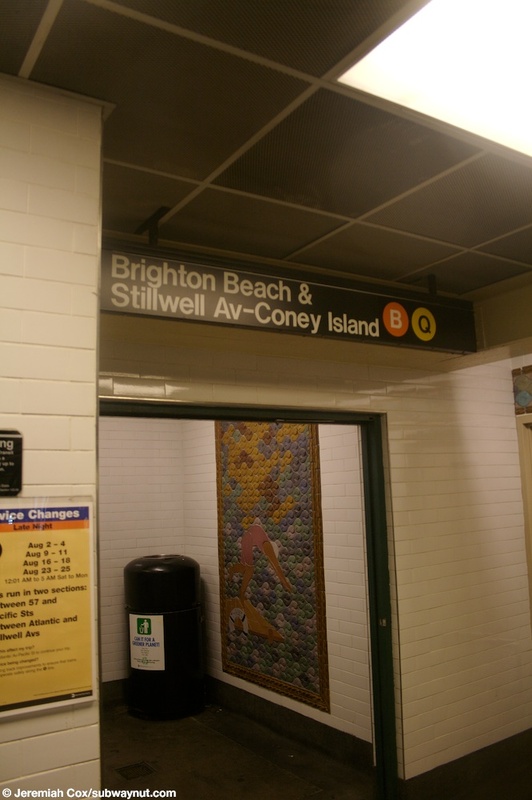 (sheepshead_bayb9) A small passageway for the Brighton Beach & Stillwell Av-Coney Island platform at Sheepshead Bay. 13 August, 2008 (sheepshead_bayb10) An exterior view of the two sets of three double-doors that provide entrances to the main station house at Sheepshead Bay. 13 August, 2008 (sheepshead_bayb11) Looking across Sheepshead Bay Road at the main subway entrance to that station. 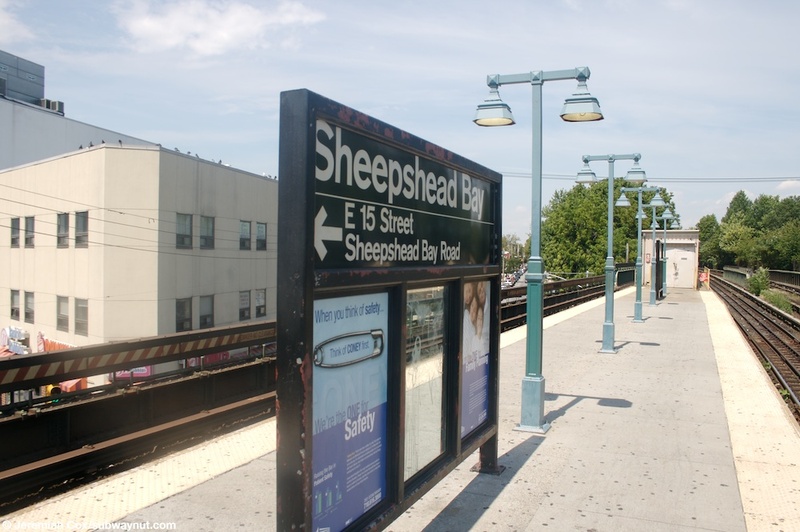 13 August, 2008 (sheepshead_bayb12) Looking down a nearby street at the Sheepshead Bay Subway station, the small platform signs on their mini-windscreens beyond the platform's canopy reading the stations name are clearly visible. 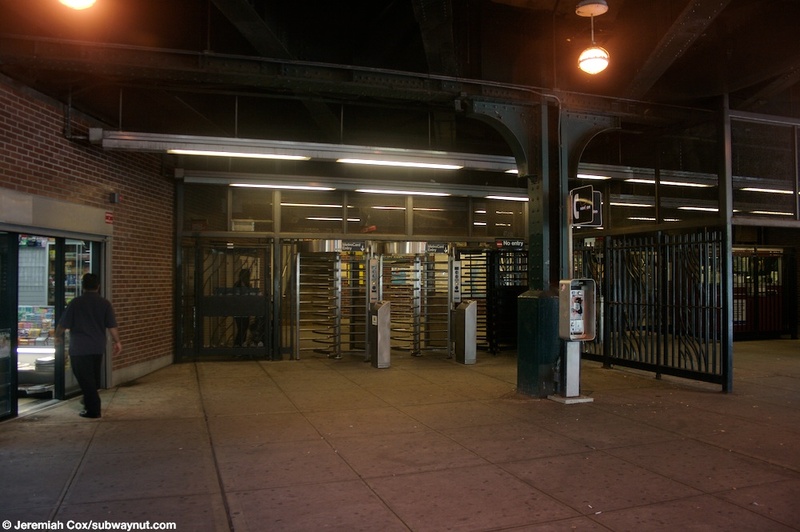 (sheepshead_bayb13) At the secondary Voorheis Avenue entrance to Sheepshead Bay, two High Entrance/Exit Turnstiles and a High Exit Turnstile provide access at this dark subway entrance tucked beneath the elevated tracks. 13 August, 2008 (sheepshead_bayb14) The part time turnstile entrance from Vooheis Avenue. The entire area can be easily gated off when this entrance becomes fully unstaffed. 13 August, 2008 (sheepshead_bayb15) The nicely bricked wall between the staircases up to both platforms at Sheepshead Bay from the Vooheis Avenue entrance to the station. 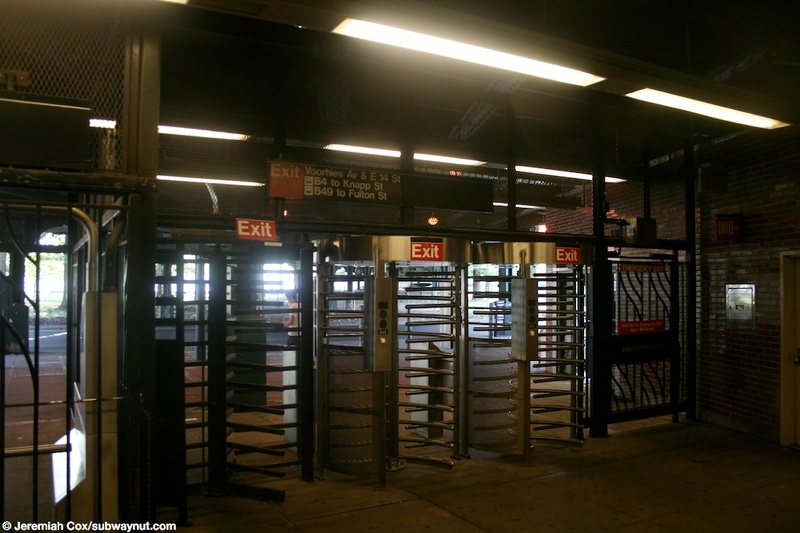 13 August, 2008 (sheepshead_bayb16) The High Turnstiles that provide away to exit the subway at the Vooheis Avenue exit at Sheepshead Bay.